Determination is something that comes naturally to Vernard Green, or Vern, as he calls himself. Spending time in the military and winning race after race on the competitive cycling circuit taught him he could do anything he put his mind to, but he admits nothing could have prepared him for his life’s greatest challenge: recovering from a total knee replacement surgery. It may sound clichéd, but Vern’s knee troubles started with an old football injury. While playing a pickup game during his time as a Combat Corpsman, he landed a solid hit on another player. “My knee just exploded,” he says. Vern’s medical training told him this was no simple injury; that he would need a knee replacement eventually. Unfortunately, he was too young for the operation at that point in his life. Never one to give up easily, Vern decided he would rehab his injured knee by taking up cycling. As it turns out, this decision would be life-changing for him. In spite of his knee injury, Vern spent the next several decades dominating the competitive cycling circuit. He competed in state, regional, and national events all over the country, winning 11 State Championships in his home state of Michigan, 6 State Championships in North Carolina, and a National Regional Championship. While he was highly accomplished in both short track and road racing, Vern always knew his injured knee was going to be a problem. After a motorcycle accident in 2016 left him with a broken leg and further injuries to his already damaged knee, he knew it was finally time to do something about it. One of Vern’s colleagues at the CDC, a doctor who had previously received a similar knee surgery, recommended Dr. Mark W. Hanna of Resurgens Orthopaedics for this procedure. Dr. Hanna and the Physical Therapy team at Resurgens came highly recommended, so at age 50, Vern decided to take the plunge and fix the injured knee that had been bothering him since his twenties. In the lead up to this surgery, Vern began working out harder than ever before, riding his bike and doing weight training (losing 60 pounds in the process) to ensure his body would be as strong as possible for his recovery. Although recovery was one of the toughest challenges Vern had ever faced, he came through it with flying colors, thanks in part to the encouraging words of Dr. Hanna and the physical therapists at Resurgens Orthopaedics. 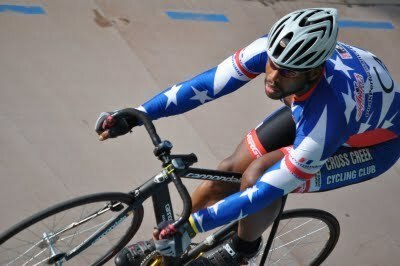 Since his surgery, Vern has been training hard to get back into competitive cycling. He has participated in some 5K runs, bike racing time trials, and is even signed up for a road race in October. Looking forward to his race, Vern feels like he’s stronger than he’s ever been and he’s confident he’ll be able to emulate his earlier success. Dr. Hanna and the team at Resurgens Orthopaedics will be watching Vern’s progress closely and we’ll all be rooting for him when he makes his return to competitive cycling. Good luck Vern; we wish you the best! Spending time in the military and winning race after race on the competitive cycling circuit taught Vernard he could do anything he put his mind to, but he admits nothing could have prepared him for his life’s greatest challenge: recovering from a total knee replacement surgery.